One of the many vintage bugs (with roof racks!) that we saw on our road trip. 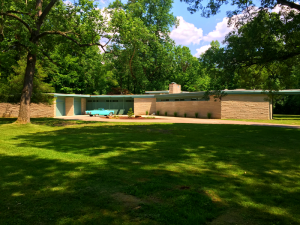 Needing a little R&R and jonesing for a small road trip, my husband and I decided to head out to Terre Haute, Indiana for a mid-century house tour sponsored by Indiana Modern, part of Indiana Landmarks. Only three and a half hours by car, Terre Haute is a city that I’ve been through (on Interstate 70) more times than I can count but had never visited. We packed up, hit the road, and almost immediately the adventure began. 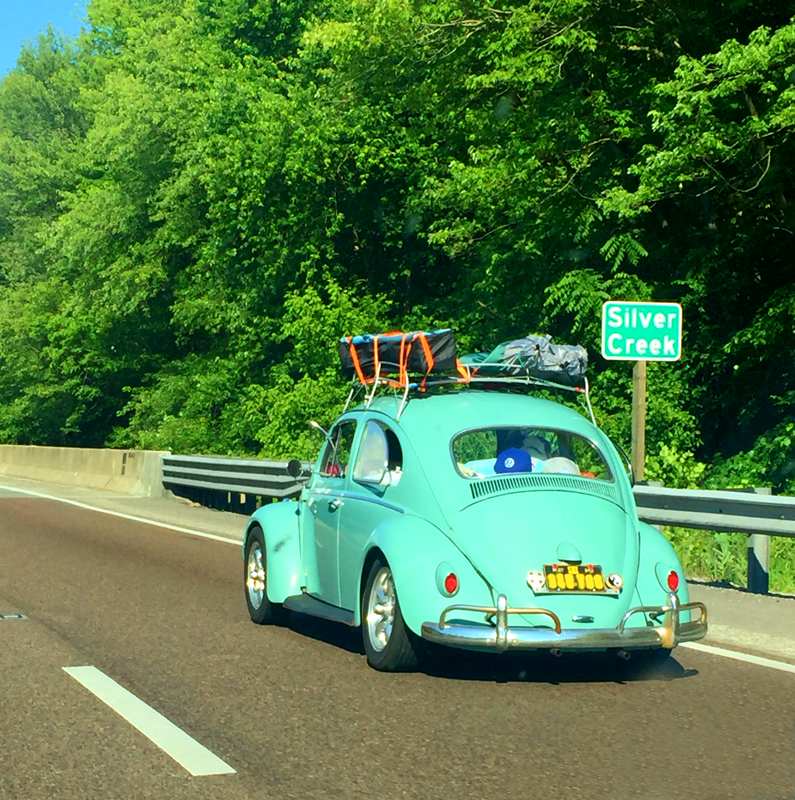 Sometime this weekend there must have been a Midwest meetup of vintage Volkswagen bugs, particularly those with roof racks. With things piled high on their roof racks. I believe we saw no less than five along the way in an array of fun colors. The trip was uneventful with only a few sections of construction on I-70 in Illinois and many fewer billboards than the stretch of I-70 from St. Louis to Kansas City. (Anecdotally, there’s a podcast about the proliferation of billboards in Missouri. Listen to it here.) 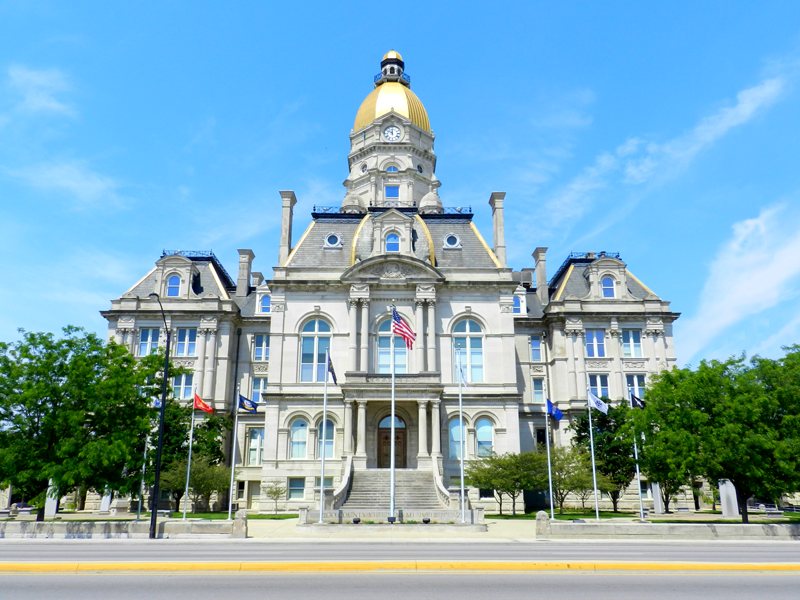 Arriving in Terre Haute, the first thing we saw was the Vigo County Courthouse. Dedicated in 1888 and made of Indiana limestone it was designed in the Second Empire architectural style; the gold dome topped by a smaller gold-dome cupola housing a two-ton bell purchased with monies from the will of Francis Vigo, the county’s namesake. The house tour was on Saturday from one to six in the afternoon. Shuttle buses were organized to take the tourists from house to house without clogging up neighborhoods with large groups of cars all trying to park. There were five houses in total ranging in date of construction from 1948-1962. The first two houses are both located on Ohio Boulevard, a large, divided street with park-like landscaping in the center island. Parts of this street are listed on the National Register, and the Parkway is significant for its development as part of the City Beautiful movement. Constructed in 1956, The Wood House features large swathes of glazing along the front of the house featuring deep, overhanging eaves with exposed beam ends similar to a more California-style mid-century architecture aesthetic. 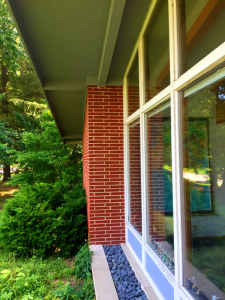 The large windows provide a beautiful vista from the living room onto the expansive yard and further onto the parkway along the boulevard. A three-sided fireplace is placed in the heart of the house between the living and dining room spaces. There are some original cabinets remaining in the laundry room, but the majority of the house has been renovated in a 1980’s/90’s style. 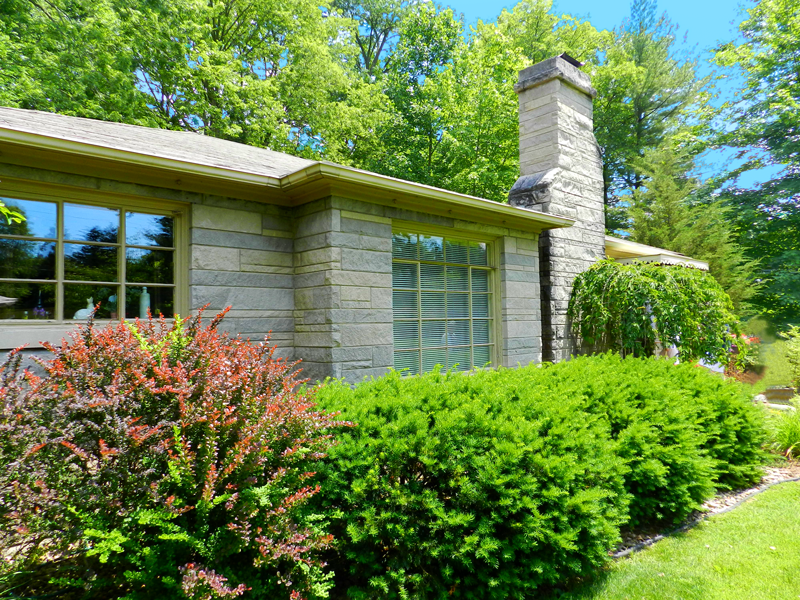 The Topping House, just doors away from the first house on the tour, was built in 1960 and designed by Juliet Peddle, Indiana’s first licensed female architect. Unlike the Wood House which opens up visibly on the front yard, the Topping House has few windows facing the boulevard and landscaped such that it recedes from the street. You enter the house into a large foyer the focal point of which is a circular, domed skylight in the middle of the room. 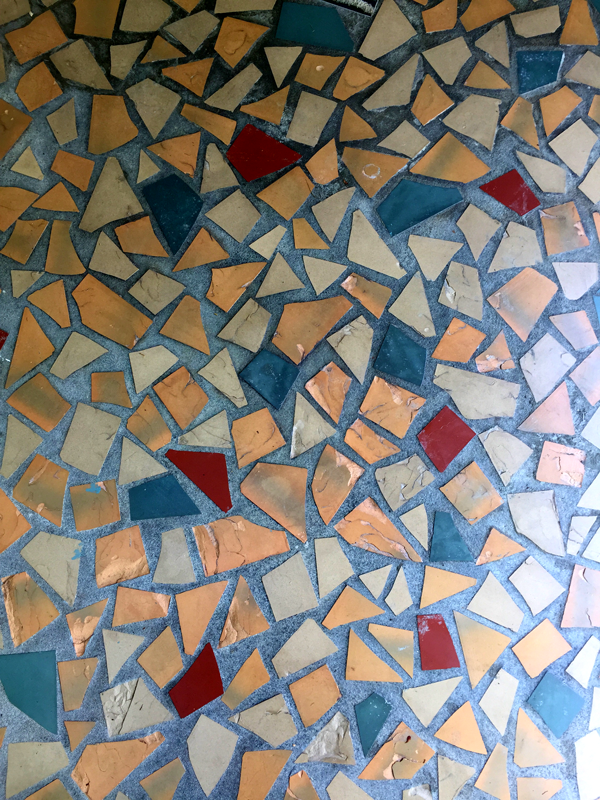 The floors are the original (and beautiful) terrazzo, with grasscloth walls. 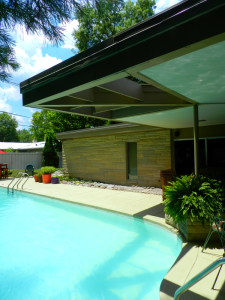 This house opens up onto the back yard, the center of which is a large pool. The corner of the deep, overhanging roof eaves extends out over the pool as a skeleton of the structure without the roof deck, letting light through to the pool. 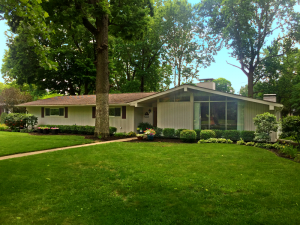 The third house on the tour, the Bohland House, is less a mid-century modern house and more of an early mid-century traditional. There are a few parts of the house where you can see the beginning of the modern aesthetic entering the architecture such as the metal casement windows and the overhanging eaves. 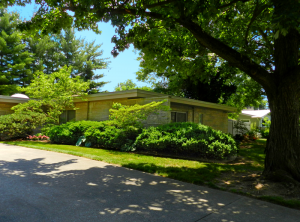 The word is that there is decidedly mid-century element to the interior of the house – the basement rec room, replete with knotty pine and linoleum, but alas, this was not a part of the tour. The next house, the Lawrence House, built in 1961-62 has been through six owners since its construction but has managed to retain almost all of its mid-century interior. The living room, dining, and kitchen are separated only by partial walls which do not extend to the high ceiling space lending an open feel to the public part of the house. The walls are finished in one-foot square wood panels which have been quarter turned. The kitchen is all original with beautiful and delicate mid-century pulls on the wood cabinets. Original light fixtures throughout complete the 1960’s vibe. 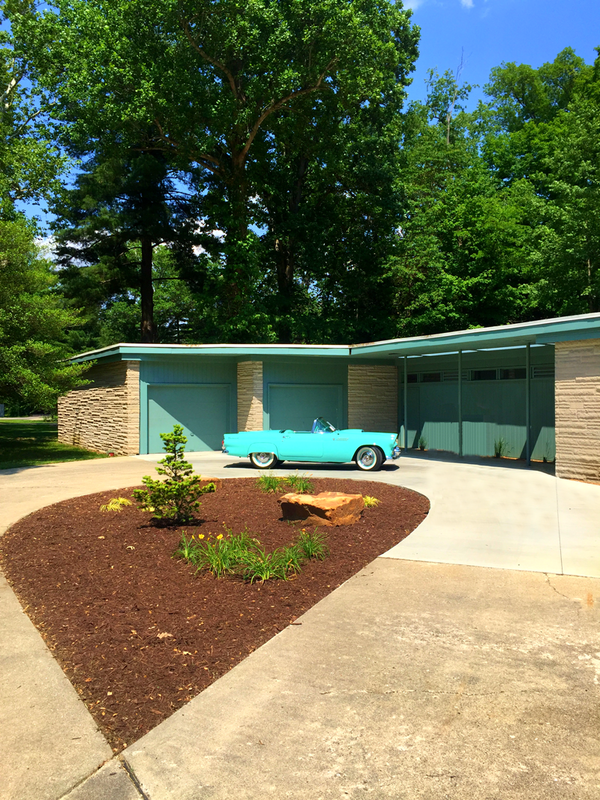 The Lawrence House house was a favorite not only because of the state of the home but also the décor and staging down to the detail of 1960’s issues of Popular Mechanics in the living room. It was also a favorite for me because, in speaking with one of the docents, we found that we had both attended the University of Vermont for the Master’s in Historic Preservation program, so we had to stop and talk for a bit about our shared experience. It is truly a small, small world. The last house, the Eble House, was the highlight of the tour. 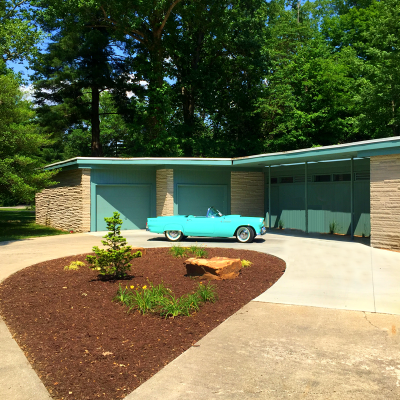 Built in 1957-58, the long, low house with flat roofs is made of Indiana limestone highlighted by mid-century aqua accents. 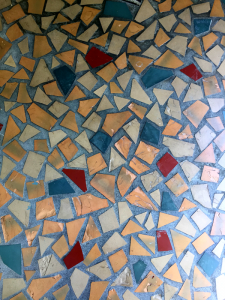 The front motor court leads to two garages and the front entryway which has a forecourt of broken pieces of glazed block in yellow, red and teal. Exaggerated overhanging eaves come to points with triangular cutouts allowing light through. The house when seen from above is a series of overlapping trapezoidal shapes. The interior was recently updated extremely sympathetically to the period. The three original bathrooms remain untouched and are mesmerizing in their mid-century colors of mint green, turquoise, and pink. The mint green bathroom walls are not tiled but are instead Vitrolite. Each bathroom has many original time-period features such as in-wall Hall-Mack tissue dispenser and hiding toothbrush holders. The kitchen retains all of its original cabinets and hardware with modern updates to the countertop, range, and ovens that do not overwhelm the design. The woman responsible for restoring this gem was at the house, speaking with many of us on the tour. It turns out that she was also responsible for saving and updating House 2, the Topping House. The tour was a rousing success, and it was such a beautiful day with full sun and blue skies. 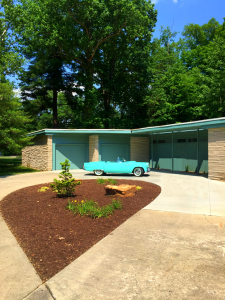 We ended our tour by driving around in some of the neighborhoods we had visited, looking for other examples of mid-century architecture and we were not disappointed. 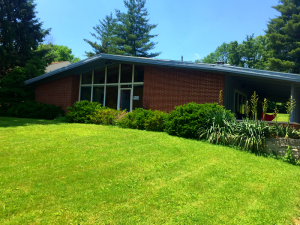 Our next mini-road trip will be to Columbus, Ohio to see the preserved Lustron house that is on display at the Ohio History Museum. We’d also like to take a trip to Columbus, Indiana, a town known for its notable collection of modern architecture. Where are your favorite mid-century houses? What tours have you taken lately? Have any mid-century road trips planned? Let us know in the comments below.